We’d love your help. Let us know what’s wrong with this preview of Moondance Ridge by Melanie P. Smith. Tony Nazario is a successful businessman, a loner with a gypsy spirit, and a sucker for a woman in need. He recently moved to Mount Haven to help his longtime friend save her failing company. He didn’t expect to meet a desperate, but fiercely independent, woman that would change his life forever. Theresa Regan is in trouble - big trouble. And, the threat is more sinister an Tony Nazario is a successful businessman, a loner with a gypsy spirit, and a sucker for a woman in need. He recently moved to Mount Haven to help his longtime friend save her failing company. He didn’t expect to meet a desperate, but fiercely independent, woman that would change his life forever. 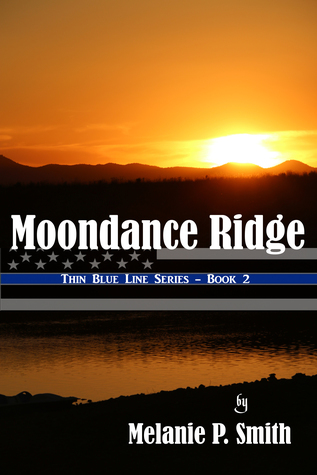 To ask other readers questions about Moondance Ridge, please sign up. A big city gangster believes that he need only issue the order for people to be threatened, beaten, robbed, kidnapped, or murdered. When those victims live in a regular small town in the USA, perhaps—but not if they’ve started a new life in Mount Haven and been taken to the hearts of the locals. Rowdy may be an ex-cop, but his sense of justice is ingrained. Threatening his loved ones is not the best way to get on his good side. When a handful of other like-minded people offer their support, it ma A big city gangster believes that he need only issue the order for people to be threatened, beaten, robbed, kidnapped, or murdered. When those victims live in a regular small town in the USA, perhaps—but not if they’ve started a new life in Mount Haven and been taken to the hearts of the locals. Rowdy may be an ex-cop, but his sense of justice is ingrained. Threatening his loved ones is not the best way to get on his good side. When a handful of other like-minded people offer their support, it makes for a much fairer fight. First the fists fly and then the bullets. Romance is in the air, but misunderstandings create unnecessary conflict, causing new and old relationships to be tested. All this, while the common enemy—the mob boss, is undermined by Rowdy and his associates. As the tale unfolds, the good guys chip away at lucrative underworld activities and bruise more than the egos of a few bad guys. Melanie P. Smith went to Dixie Collage and the University of Phoenix where she received a Bachelor of Science Degree in Business Management. She also has a Postgraduate Certificate in Conflict Resolution and Negotiation from the University of Utah. She worked for the Salt Lake County Sheriff's Office for over 26 years, most of that time was in the Special Operations Division. She was part of the support staff for the SWAT team which required her to respond on call-outs where she manned the radio in the SWAT command post and coordinating communication and logistics. She was also on the logistics team of the Child Abduction Response Team. In addition, she worked closely with Search & Rescue, the Mounted Posse, K9 and the Motor Unit. She has been able to utilize her knowledge of police and rescue operations as well as business practices to make her novels fun and exciting.